Nick Cheung, Louis Koo, Francis Ng and Charmaine Sheh star in a spin off of a TV series which concerned the murder of a police official who wiped the files of all the undercover officers before he died. Here the story picks up with one of the former under cover cops being contacted by a previously unknown officer named Blackjack. It seems he's aware of some big moves going on in the under world and he begins feeding the police info. The trouble is the cops can't be certain if he's real since the Blackjack file was damaged to the point that all they know is that it is "something" but they aren't sure its even an officer. 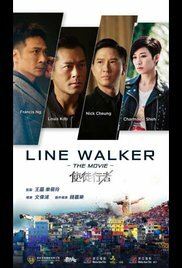 LINE WALKER is being poorly released in the US. Itsonly in a tiny number of theaters and the company doing the PR is sending tickets to the press and not screeners so any reviews will appear during or after the run. There appear to be no ads for the film and as Joe Bendel and I were standing outside the theater waiting to go in we were being asked what the film is because no one knew. Its a shame because this is one of the best Hong Kong films I've seen this year. How good is the film? When it was done I was ready to climb back on board and go for it all over again. I couldn't wait to get home and type it up so that I could start to get the word out on the film. Is the film perfect? No. There are a couple of bits that seem to be a bit too referential to the series and some of the shifts in the final bit don't make complete sense- I mean how does the bad guys know where a certain place is? However its not even remotely damaging, it's more a tiny scratch in a new car's paint as opposed to a damaged fender. The action and the well drawn characters carry it all along. After the film ended Joe and I both agreed that this was a film that needs to play at New York Asian.Film Festival next year- or anywhere people love Hong Kong action. This is too good a film to have slide off into oblivion because people don't know it exists and because it gets almost no publicity. Playing in a tiny handful of theaters LINE WALKER is a film you're going to have to search out. Hopefully it will get a home video release so that the film can finally find the audience it deserves.